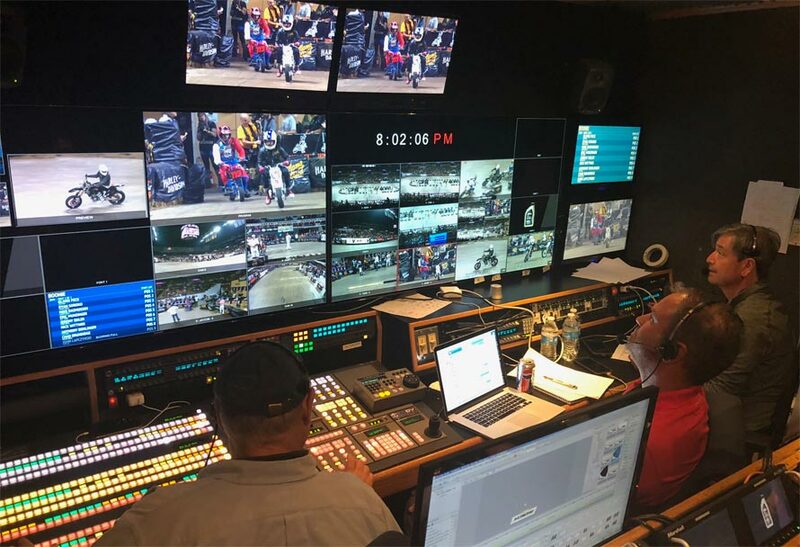 To capture the excitement of its 115th anniversary celebration during the 2018 Labor Day Weekend, iconic motorcycle brand Harley-Davidson asked Nashville-based TNDV to provide facilities for live HD coverage of three motorcycle races around Milwaukee within an intensive, fast-paced 18-hour window. Throughout the weekend, thousands of motorcycles filled the streets, and spectators gathered at three venues to watch the Flat Out Friday, Hill Climb, and Beach Brawl race events on venue Jumbotrons. The events were also produced for distribution over Facebook Live. TNDV served as technical producer, managing two of the company’s high-end HD mobile units and TV crews, and worked closely with sports specialist Ohlmeyer-Kussero Group, which produced all three races. For the Hill Climb and Beach Brawl events, TNDV managed, crewed and operated the venue AV systems, including five large-scale GoVision LED walls and public address (PA) systems. At the start of each event, TNDV sent a main and back-up program feed to Switchboard Live, a cloud-based content distribution service. Switchboard Live’s on-site technicians handled live encoding and streaming of the shows to more than 700 Facebook pages simultaneously, including sites associated with Harley-Davidson, their dealers, and fan clubs worldwide, making it appear as though the live events were originating from each of these pages. The service also provides in-depth reporting on delivery performance, audience reach and more. “Harley-Davidson is an enterprise, and their objective was to extend the reach of their content to their global deal network, athletes, partners and other sponsors to a variety of consumer-facing, video sharing platforms,” said Jayson Fuhlbruck, Growth and Partnerships for Switchboard Live.